Digital assistants can do many things well, but no single one can do everything that we need. That's why we use different ones, depending on what we want to do and what device we are using. But what if they could talk to each other, so we wouldn't have to switch between them anymore? Amazon and Microsoft have decided to do just that, announcing that Alexa and Cortana will soon be able to work together to help users do what they want much more quickly and easily. Here's what that means for the two tech giants' customers. On Windows 10, Cortana users will be able to call Alexa simply by saying "Hey Cortana, open Alexa." This functionality, Microsoft says, will be available later this year, and it will also be offered to users on Android and iOS who have Cortana installed "in the future." 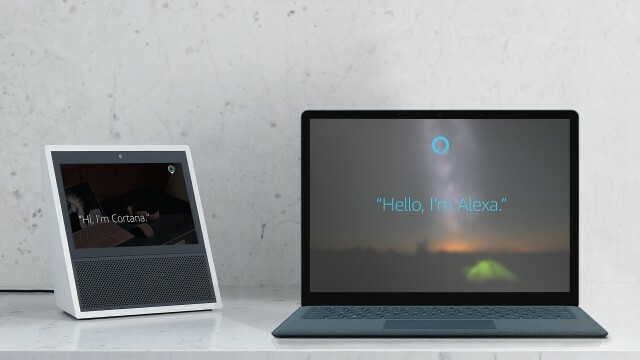 Similarly, Cortana will be available to Alexa users on Alexa-enabled devices like the Echo, Echo Dot and Echo Show simply by saying "Alexa, open Cortana." This goes beyond just opening the other digital assistant, as the photo above and the two tech giants statements indicate. "Cortana users will be able to have Alexa shop on Amazon.com and manage their Amazon orders and access many of Alexa’s third-party skills by asking Cortana to open Alexa," explains Microsoft. "Alexa customers will be able to access Cortana’s unique features like booking a meeting or accessing work calendars, reminding you to pick up flowers on your way home, or reading your work email," adds Amazon. Amazon and Microsoft say that Alexa and Cortana on Alexa and Cortana enabled devices will be able to talk to each other later in 2017.